Since 1965, Willats has made a series of project works with diverse communities and within different locations. These works are directly interactive, involving individuals and their immediate community, they take place outside the gallery context and within the environment of the people who take part. They are time dependent works, and only operate for the duration of the project itself. 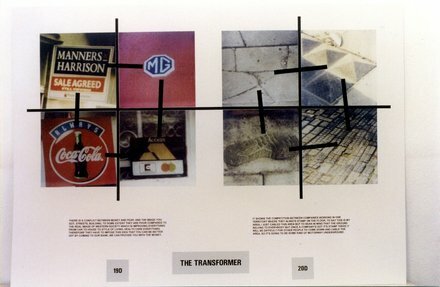 Transformer was commissioned by the Middlesbrough Art Gallery in 1997 and it presented an interactive model that viewers could use to transform their own experiences of their immediate reality and to reflect how that compared with how other people saw the same things. The work was concerned with connecting local institutions that were not normally connected, the Gallery, Community Centre, Library and Media Cafe – changing the way they functioned for people - each site being a point on a circular walk in the neighbourhood of the Art Gallery. In the development of Transformer, Willats first made a walk with local residents, during which they found objects, elements in the environment that they personally transformed by their individual associations and then a workshop took the ideas further. In each of the four locations there was then a wall mounted display made from the photographs and texts that represented different ways of viewing daily life encountered on the walk and made from the original group of collaborators. Anyone could participate by doing the walk themselves, recording their responses in modelling book – The Transformer. This book presented a series of questions for participants by illustrating items from the fabric of the environment experienced on the walk. You had to make connections between objects and signs reproduced in the book and the actual objects and signs at particular spots on the walk, creating links between these fragments. Responses were also stuck on a grid in the gallery so you could compare your responses with those of other people who had done the walk, demonstrating the variety of our individual understanding and communication, enabling you to relate your perceptions to those of others, and gave a public expression of the connections between people.